The One-Click Cleaner is an easy-to-use option for cleaning connectors on jumpers and in adapters. Simply insert the One-Click Cleaner into an adapter and push until an audible “click” is heard. 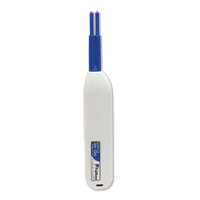 The One-Click Cleaner uses the mechanical push action to advance an optical grade cleaning tape while the cleaning tip is rotated to ensure the fiber end-face is effectively, but gently cleaned. The One-Click Cleaner is a must-have for field technicians. Small enough to fit in a shirt pocket and a great addition to cleaning kits. Save your wrist – no more twist! effective, easy-to-use cleaning solution for LC/MU connectors.